Welcome to another Big Unwrap, an exciting one for me as it contained potential birthday presents: big YAY! Before I get onto that, I wanted to apologise for being remiss about the irregularity and frequency of my posts. When I started this blog 3 months ago, I had the intention of doing 3 posts a week as my youngest is at preschool 3 days a week, so makes sense, right? With a puppy welcomed into our home around the same time as I started blogging; school holidays; bank holidays; regular home-making duties & of course learning on the job (in other words, I’m not the speediest at uploading / tagging / editing etc…), the reality is, on average, I have managed just one post a week. So, here’s my new plan: I am going to commit to one post a week at the very least, and you can expect it every Monday/Tuesday. Right – back to my birthday presents! Those of you who follow me on Instagram will know that we’ve just had 3 out of 4 of our Thread-family birthdays all celebrated across just two days last week. It is seriously as expensive and as exhausting as Christmas. Not to mention all the cake! Now I have shopped at Topshop since the beginning of time, whether they were in or out of fashion, primarily because they have always, always stocked small sizes. 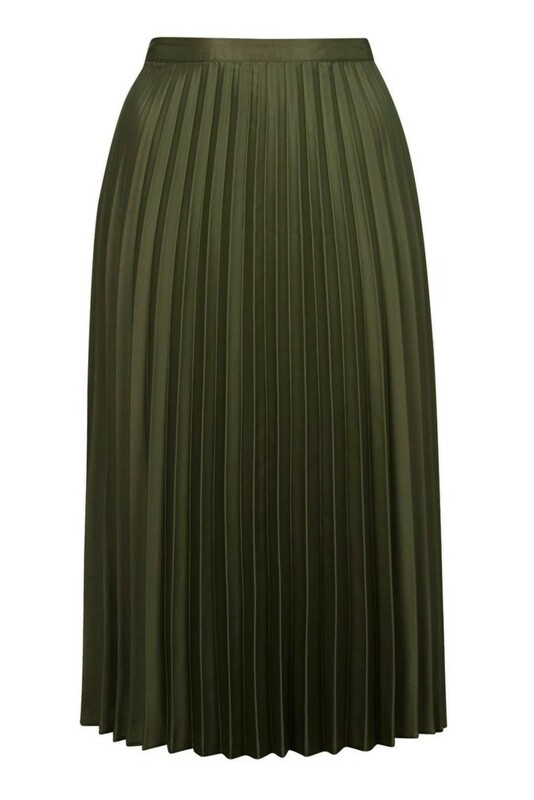 This Topshop Petites Midi Satin Pleated Skirt in an Olive/Khaki colour: it’s the biz! In all honesty, I’d tried it on and wrapped it back up about 4 times, fully intent on returning it: because I just wasn’t sure I could carry it off; the fabric felt too thin and the £45 price tag too steep; this style of skirt (i.e. sits on your true waist) has a tendency to make the most willowy appear more ‘hippy’ and therefore made me feel like it made my back side look enormous. Eek! However, each time I re-tried it on, I liked the skirt a little more and more until… I’m delighted to share with you that its a keeper! Whoop! If you are teetering on the edge of whether or not to buy one of these Topshop skirts, I would urge you to give them a go. Topshop has this colour/style of skirt stocked in Regular, Tall & Petite lengths, although there is also a Pink Satin version I’m eyeing up, and again, available in Tall, Regular & Petites: just fabulous! 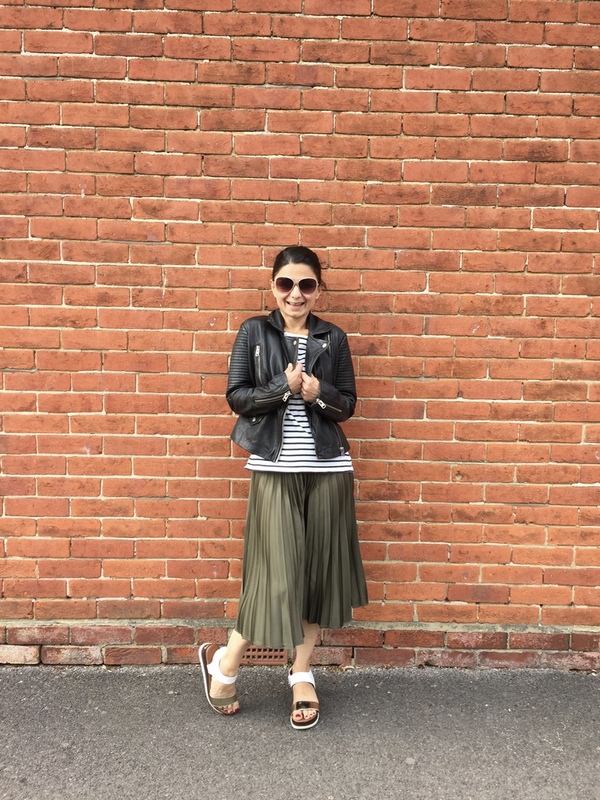 The fabric has *just* the right amount of sheen; and, because its a light satin, there is a lovely swishy-floaty factor which will add to that feminine, girly feeling you get when you wear such a skirt… but also, you don’t have to wear girly bits with it: style it up with sneakers and a leather jacket. And here’s a thought where my age is clearly showing through: depending on the weather, the fabric *might* get a bit too static-y (!!) and so if that’s too much of a worry for you, Topshop also have a Dusty Pink Midi Pleated Skirt as well as a Pale Blue Midi Pleated Skirt both of which are in a jersey fabric rather than Satin. 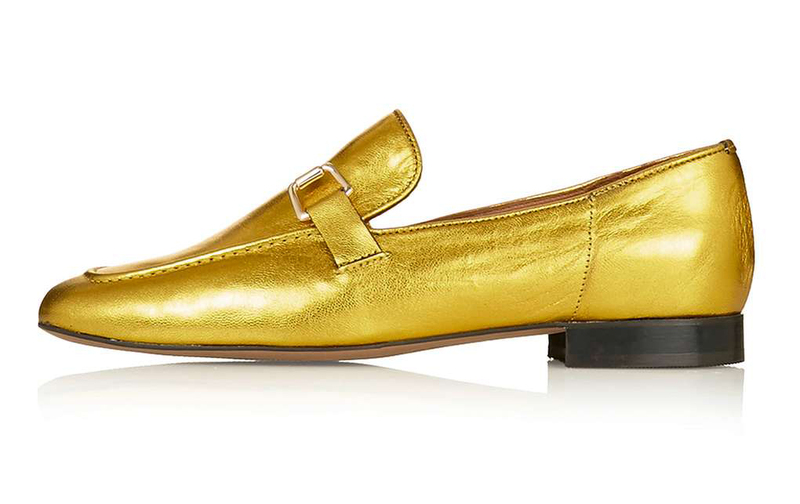 These have been much compared to Gucci’s but if you’re anything like me and have never been anywhere near a Gucci loafer in your life, there is nothing to compare them to. I’ve just accepted these as a beautiful looking loafer that I couldn’t help but gravitate towards: its the bling-factor! Now again, as with the skirt, I initially couldn’t quite come to terms with just how much of a yellow-gold they were. And, like the skirt, I have tried them on & re-boxed for returning several times… and just like the skirt, with every wear, I have fallen a little more in love. And although the Karter’s were sold out in Yellow when I did my last post, they are now back in stock and are also available in White, Black and now Silver too. (I might have ordered a silver pair – research you understand! Will keep you posted). 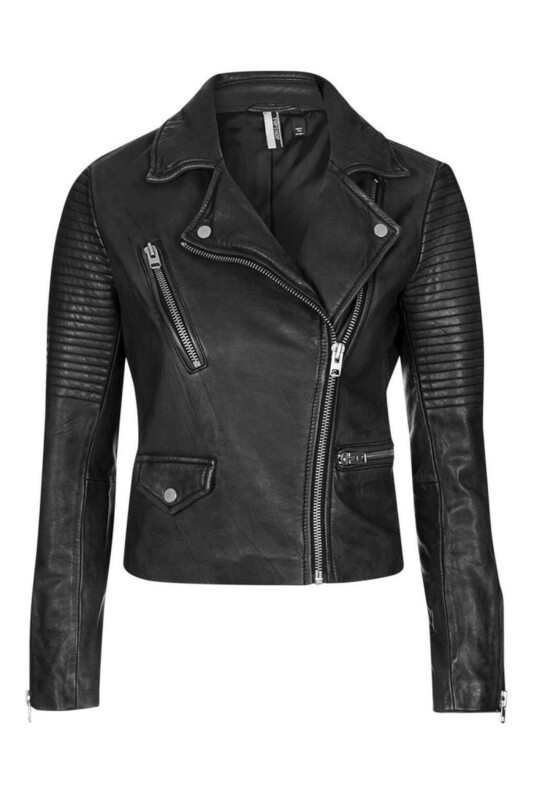 So from this last photo, you might be able to guess what my main birthday present was: on my actual birthday, what can only be described as the hottest day of the year, I received my main present: the Topshop Petites Leather Biker Jacket: Love it. 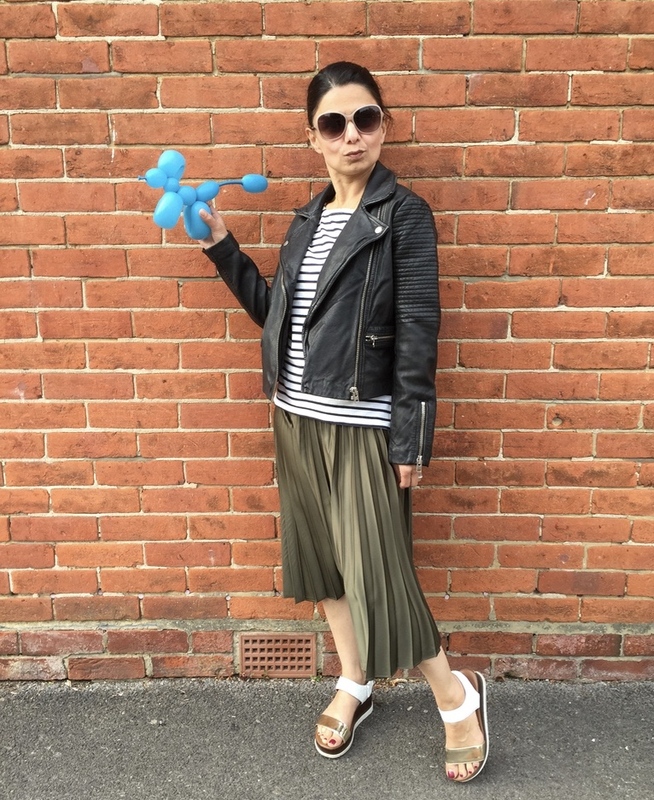 I wore the pleated midi skirt for Little Moon’s 4th birthday party with a simple breton top & my pre-birthday-present Russell & Bromley Deluxe Sandals and, I have to say it: I felt good in this outfit! Like I’d made a bit of an effort for my 4 year old’s first ever birthday party, but not overly dressed up. Once the party was over and everything cleared away, it was time to take the boys for out for a spot of dinner because as you can imagine: after hosting a 4 year old’s party in our own home, cooking dinner was the last thing I wanted to do! I’m a standard Topshop size 6, and previously I tried this on in-store in a size 4 (closest they had in stock to my size), which fitted me comfortably across the shoulder; however I tried it on over just a tee… which means although the size 6 might feel a teensy bit roomier, I know come Autumn, it will fit comfortably over layers and I won’t have scrunched up sweaters under my armpits! 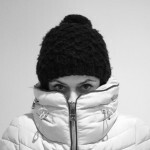 My 7 year old told me he thought the sleeves looked too long: truth from the mouth of babes, eh?! Ok, I admit, they may be like… 1/2 a centimetre too long, but once I’ve worn the jacket in and it gets the inevitable sleeve-creases that leather jackets get, I don’t think the sleeves will be a single millimetre too long, at all! You’d think I’d know better than justifying myself to a 7 year olds comments! 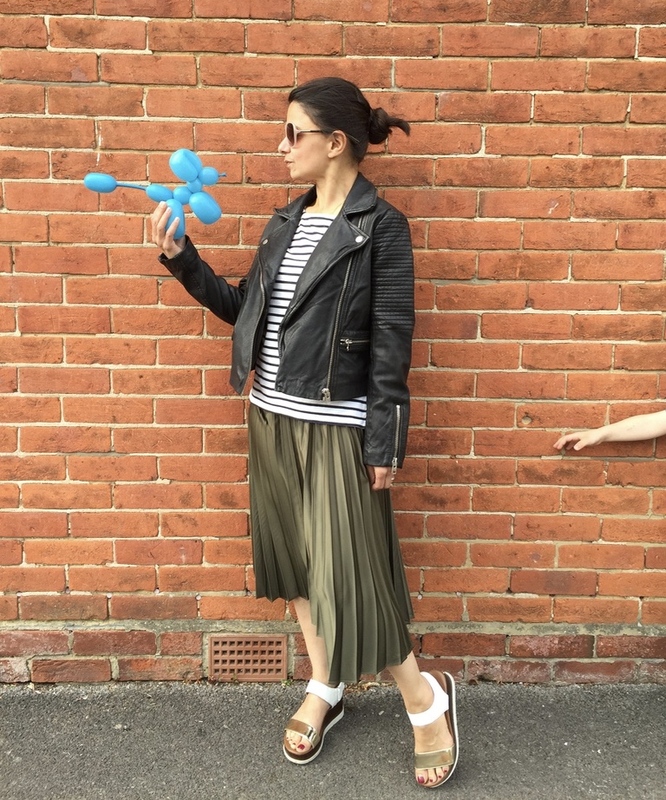 Photobombed: by Little moon’s arm which remained outstretched until i returned his balloon dog the entertainer from his party had made him. Of course there was a balloon-animal-making magician: We weren’t going to have the best part of a dozen 4 year olds in our house without the help of an entertainer! The leather is, to use a cliche, ‘buttery soft’ and I don’t have any complaints. The silver hardware on the jacket is a little heavy looking on my small frame (especially the zips on the sleeve), however, to have a leather jacket fit me properly and with sleeves that are the right length – is amazing. I’m very happy with it & cann.o.t. wait to wear it some more! I bought this for myself with some birthday money from my lovely sister-in-law. 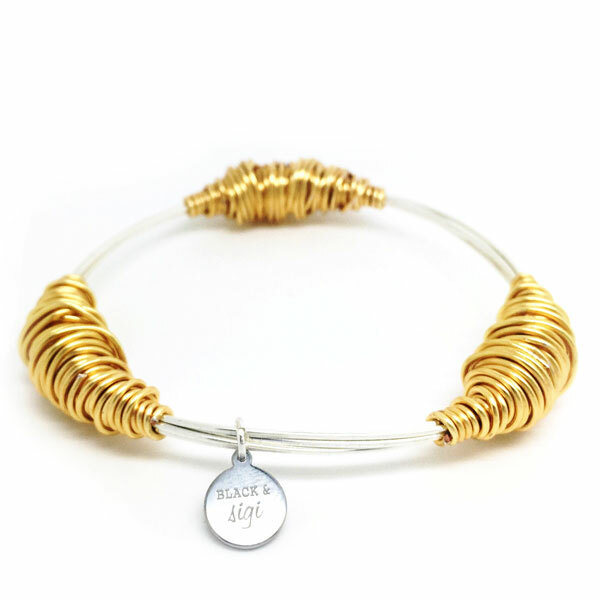 The bangle is a lovely weight and feels very well made: its both eye-catching and easy to wear…just needs another one or two further bangles to create a stack, don’t you think? 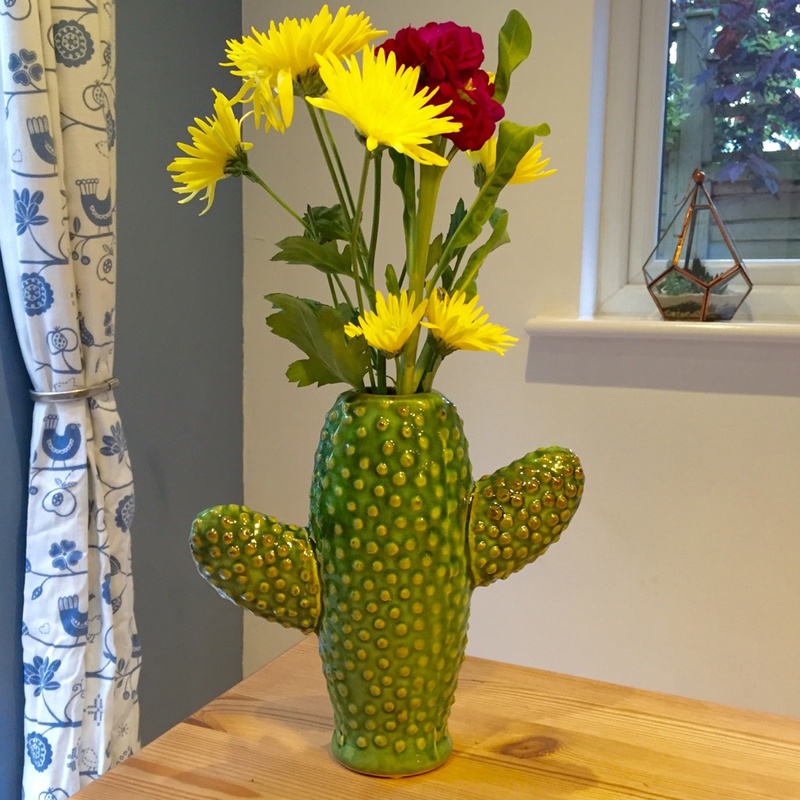 And finally, the biggest surprise came from my best ‘small-town’ buddy: yes, a cactus vase! I was a teensy, tiny bit disappointed not to have received one on my birthday, but when my friend dropped by on Friday evening with a belated pressie, I was honestly, honestly thrilled. Sometimes, its the small things, right? Before I end, I’d also like to put it out there now: I have a lot of time & love for Topshop Petites. 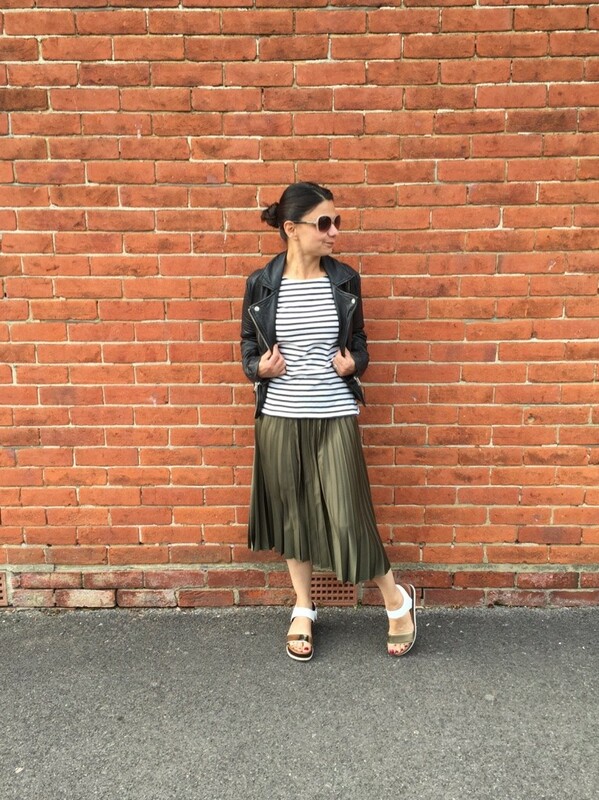 I’ve been shopping at Topshop since the age of 16 and over the past 29 years (eek!) 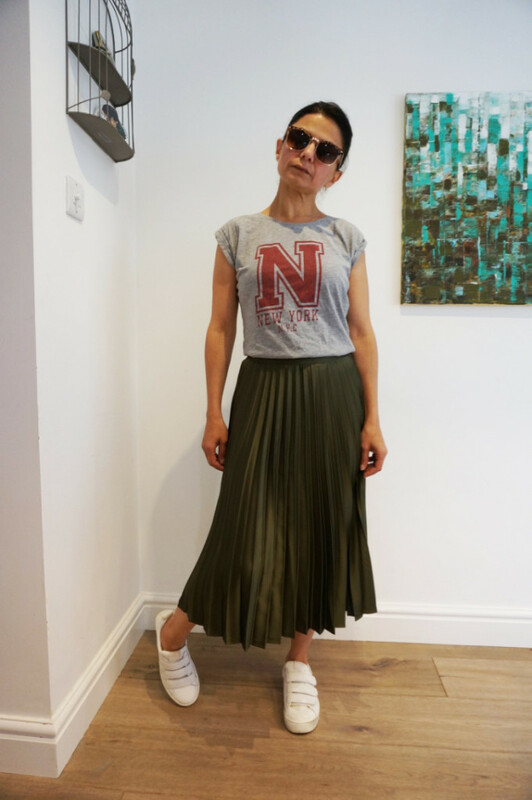 they have dipped in & out with being too ‘teen’ like, but for the best part, they always have a few pieces which are more than wearable for my age, but best of all: this is a brand that caters for the teensy-shorties in the world like me with clothes which fit and all very affordable. I doubt very much Topshop PR are reading this, but if they are: a big thank you from me for having such a varied Petites range and for doing not just clothes in small sizes but shoes too! Some shops have stopped stocking size 36, yet Topshop not only stock a size 36, they go right down to a 35. Time to get the boys to bed: I’d love to hear what you think of my birthday haul? 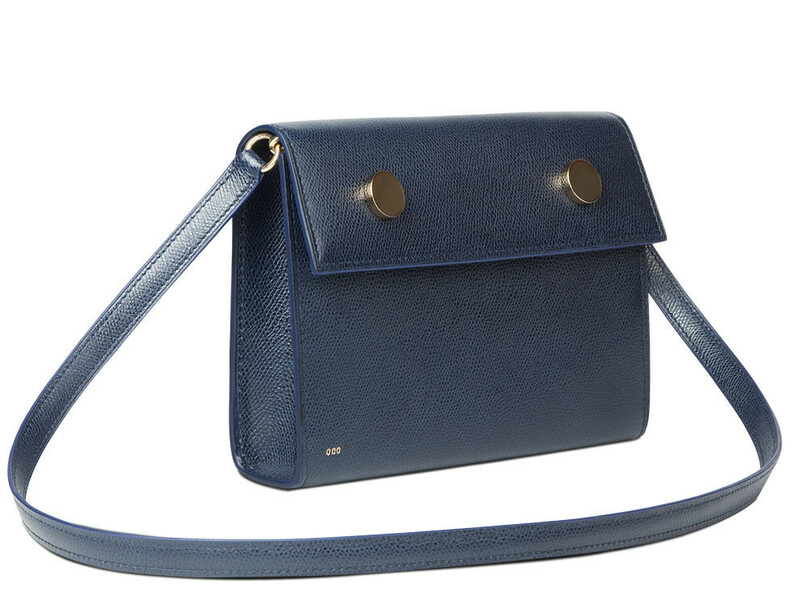 Would you have gone with just the one expensive bag over the 3 pieces I ended up with? I couldn’t be happier with my presents and feel pretty blessed and loved: the RSVP Paris bag is being carried forward to a Christmas wish-list!! !